Thankfully, after being released from the hospital Mark has not been in a single institution. Trying his best to improve, he has participated in many forms of rehabilitation. One of the consequences of his brain injury is left hemiparesis – a partial paralysis on the left side of his body that causes left foot drop, left knee hyperextension, and left finger/hand/arm incoordination. With this condition Mark first had to learn to walk between parallel bars, then to walk without assistance. Mark has to think about every aspect of walking with each step. He also had to try and relearn everything his left hand did pre-injury, automatically – for instance tie shoe laces, shampoo his hair, handle everyday items like flat wear, and 15 years later – typing on the computer. Ten years after his accident Mark learned of the Brucker Biofeedback Method in Miami Florida that uses the Neuroeducator II Electromyography Biofeedback System to measure the motor unit action potentials that are generated by a patient’s active muscles. After completing his first therapy visit to Dr. Brucker’s Biofeedback Center, Mark could walk much better, not altogether normally, but much better. The success from one week in Brucker Biofeedback therapy surpassed that of the previous ten years of physical therapy. While in Florida Mark was introduced to a specific modality of massage therapy called Hoshino Therapy the benefits of which were far beyond what any other massage technique was able to provide. Then, and each time following participation in Brucker Biofeedback Therapy, he was able to receive Hoshino Therapy at the Center for BioTheraputics in Coral Gables, Florida. In the mid 90s Mark enrolled in graduate school and earned a Masters Degree in Rehabilitation Counseling 17 years after his TBI. A year later he passed the National Licensed Professional Counselor exam. He began working for the Brain Injury Alliance of Colorado (BIAC) in 2003 and is currently their Statewide Support Group Coordinator. 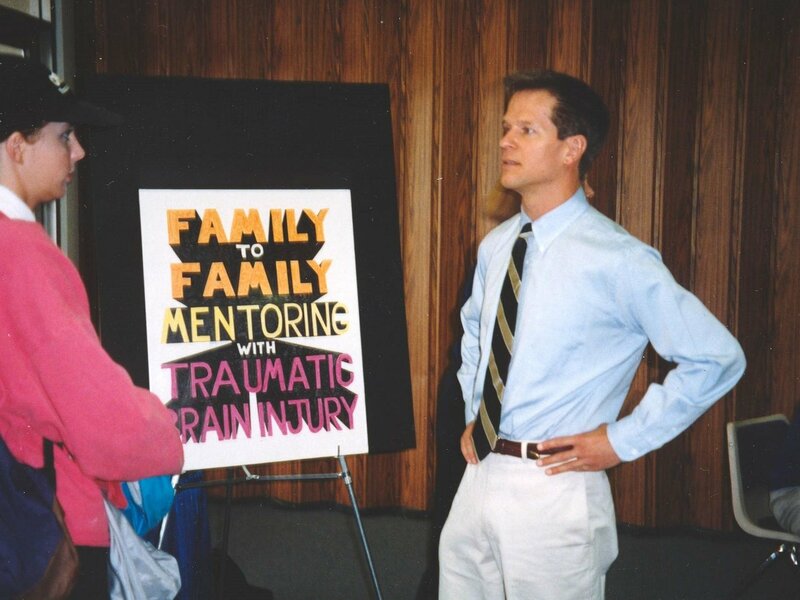 The picture to the left is of Mark in 1998 talking to a guest at one of BIAC’s annual conferences where he was invited to present his novel concept/program of “Family to Family Mentoring with Traumatic Brain Injury” – before he began working for them five years later. Thirty-three years after his accident, Greg Roskopf’s Muscle Activation Technique (MAT) physical therapy, recommended by attorney Steve Shapiro, helped him make more progress than he had in all the years beforehand. Dr. Eryn Paetz, PT, DPT, Total Body MATRx Specialist works with Mark. Thanks to a series of MAT therapies in 2016, paid for by HelpHopeLive, at his second biannual Brucker Biofeedback therapy that year, Mark made his best improvement ever in left neuromuscular recruitment! In fact his left leg was able to recruit a stronger signal than his right – the Brucker clinic had never in its history seen such improvement from hemiparesis more than 30 years post injury! Doctors have prescribed bi-annual Brucker Biofeedback therapy in combination with weekly MAT PT. Mark rebooted his Help Hope Live fundraising in 2017 to cover the cost of those therapies. In 2021 Mark will only require monthly MAT and annual Brucker Biofeedback therapies and expects to be able to cover the cost for this at that time. To help Mark cover the cost associated with the therapeutic regime to get him to that point, his fundraising campaign with Help Hope Live (helphopelive.org/campaign/10164) remains open. To make a tax-deductible donation to Mark’s campaign, please click Donate Now.